Still trying to wrap your head around H.P. Lovecraft's mysterious Elder Things and collection monsters who lived below the ice of the Antarctic? 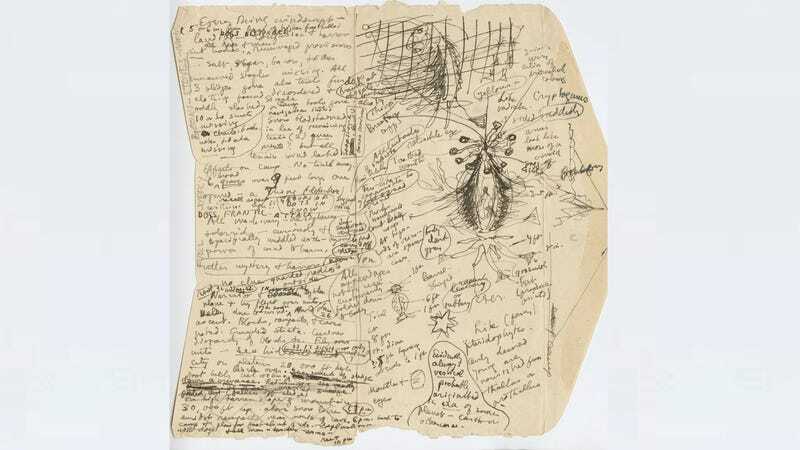 Well, now you can see exactly what these mysterious beasts looked like from the author's point of view, thanks to a few pages of recently discovered doodles right out of Lovecraft's notes. There's plenty of detail here, including color annotations and side views of the ancient beasts. It's really pretty stunning to see, as we could never fully wrap our head around the descriptions of these beasts (but had a lot of fun trying). We wonder if Guillermo del Toro consulted these files while sketching his own version of Madness. These pages are part of a much larger exhibit at Brown University — "The Shadow over College Street: H.P. Lovecraft in Providence" will be on display through September 22nd in the Philbrick Rare Book Room of the Providence Athenaeum. A smaller satellite exhibit will be on view in the lobby of the John D. Rockeller, Jr. Library through October 24th. Go!